After years of experiencing checkpoints, road blocks and adhering to the Israeli separation barrier across the West Bank, I came to an entirely different barrier that I had to cross: this barrier was the fence blocking the front entrance to the Jon Stewart and Stephen Colbert "Rally to Restore Sanity." Typical Middle Easterners that we were, my Jewish friend Scott Cooper and I came to the rally a couple of hours before it started, assuming we were early. We had done this in the hopes that we would be the first ones to arrive at such a ridiculously early hour. As we arrived we were shocked to see thousands of people who looked as though they had been living there for days. The front area was closed and heavily guarded by the D.C police. Scott and I refused to give up on our dream of making it to the front area. Where many others had tried and failed we knew we could succeed. With our experience of conflict resolution, occupation, reconciliation, and mediation, we knew it was only a matter of time before we would be standing near the stage to watch the man we both refer to as our hero. There were about 150 people on our side of the fence with family members inside, who, having left to buy sustenance previously, were now not allowed back into the front area. Due to this, families were mercilessly separated and the police showed no compassion. Scott and I became their spokesmen. We tried to appeal to the conscience of the policemen but it was in vain. Even the emotional tears of two pimply, stressed-out teens whose family was waiting inside could not sway the police's hard line. We understood that this is not going to be an easy mission. Rising up to the challenge ahead of us we decided revolutionary action must be taken. After all, I had enough experience from the first Palestinian Intifada. A plan was hatched that all women and children (or in this case feisty liberal grandmothers and crying teenagers) should jump the fence, in the hopes of being less brutally punished if caught. Our hypothesis was not correct and the woman and children were immediately kicked back behind the line. We were being treated like intruders and we were not going to take it laying down. Moving on to our next revolutionary attempt, we decided to storm the barricade hoping that our combined forces would break it down, I tried to convince the displaced people that this action falls into the category of "nonviolence'. I declared that we must bring attention to the lack of sanity among the policemen. 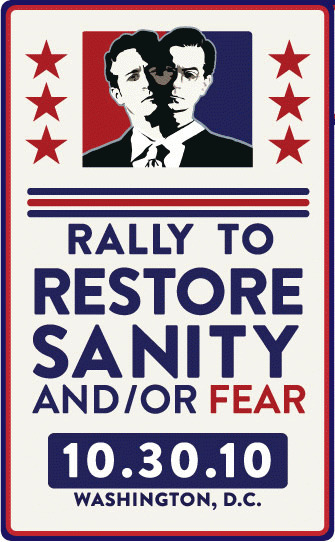 "If this was a rally intended to restore sanity', I said, "why not start with the insane policemen?' Unfortunately, my followers didn't seem as excited about my idea as I was, and the policemen who were overhearing our conversation seemed ready to beat the revolution out of us. The next approach on my mental list of conflict resolution tactics was arguing with the policemen. I used to do that in Jerusalem and sometimes it worked, although most often it didn't and actually led to bad consequences. Unfortunately I was desperate to get in and was willing to try any means. I told the policemen that they were committing an act of insanity, that it was commonsense to let families be united, that they were supposed to protect us, not oppress us. My ramble of insults and demands fell on deaf ears. We were only minutes from the beginning of the rally and I was losing my patience, but the occupation that has been lasting for 43 years has taught me to never relinquish my rights or give up. My final strategy was to try to negotiate an agreement with the policemen. They were unimpressed that many of us had congregated outside the entrance gate and were ready to disperse us. There I found my starting point into a deal, and I mentally pulled up a chair at the negotiating table. We decided to send one of the people inside to look for the lieutenant and offer him a deal. For every person that leaves the front area they would allow one of us "outsiders' to get in. At the same time, we convinced the policeman at the gate to start counting people exiting the front area whilst waiting for the approval from the lieutenant. Roughly ten minutes later, we had a deal and peace was prevailing. We had already counted seventeen people leaving the barricaded area and the policeman started to allow us in, one at a time. Scott and I were number five and six. I had been waiting for this moment for weeks, having even flown back from Jerusalem to D.C a week early to make it to the rally. Jon Stewart is one of my role models and there was no wall that was going to prevent me from being there. I would never have guessed that my work on bringing an end to the Israeli occupation of the West Bank would give me the tools to see my comedic hero. Achieving such a resolution by using the simplest of negotiating approaches gave me hope that one day they will work to produce a result for a slightly more complex conflict closer to home.